West Hollywood, pop. 38,000, is 5 miles west of downtown Los Angeles. It may be possible for you to completely ignore your West Hollywood ticket! 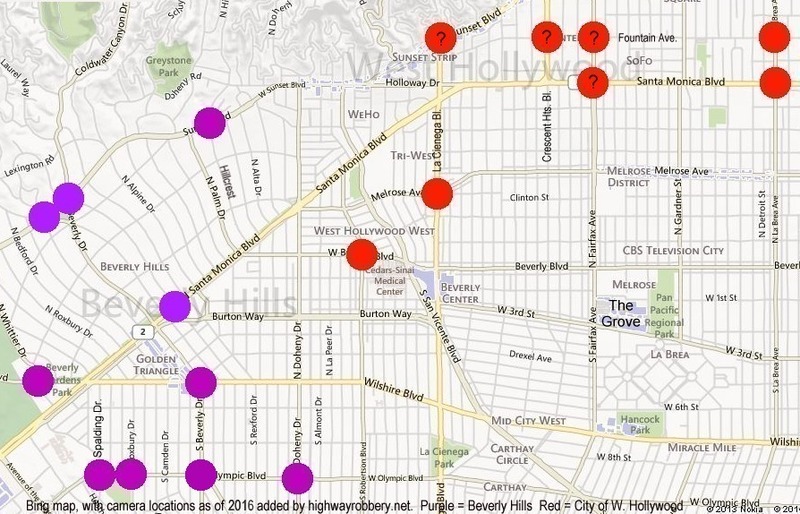 Did you get a right turn ticket in WeHo? If so, see Ticketing Highlights, below. Yes, this is the webpage with a LOT of info about tickets from the red light cameras in West Hollywood. For explanation of the red dots with question marks, see Set # 6, below. Call (323) 848-6400 for council meeting dates or for general information. Call (323) 848-6460 to leave a message for the mayor. Call (323) 848-6375 for information about the red light camera program. Right Turn Enforcement Has Been Added - See Ticketing Highlights, below. (1) Totals are as provided by the City. (2) These annual totals, or annual projections, are by highwayrobbery.net. The 2017 projection is based upon the last four months of the year. (3) From the Dec. 2011, Dec. 2012 and Dec. 2013 reports, above. (5) For the Xerox system (1999 to 2015), the figures in red type are "raw" violations recorded by the cameras, and may have been posted only for selected months or locations, due to time limitations. The figures in black type are citations issued. For Gatso system, see footnotes 12 and 13, below. (7) The extra-wide vertical grid lines are for the convenience of the reader - they have no other purpose. (8) On page 3 of the report for Dec. 2014 the lower ticketing during Nov. and Dec. was attributed to various construction projects. The report for Mar. 2015 said: "All of the locations that were down due to loop issues are once again in service." Also see Set # 9, below. (9) In late 2015 the cameras at the locations marked "X" were shut down - but maybe not permanently. See Set # 6, below. (10) The citywide total for June 2015 was calculated by subtracting the Jan. - May. totals (found in the monthly reports generated by Xerox, and shown in the table above) from the six-month total given in Appendix 1D of the sheriff's semiannual report to the city council. The citywide total for Sep. 2015 was calculated by subtracting the July - Aug. totals (found in the Xerox reports) from the total given in the sheriff's semiannual report. (11) Apr. 11, 2017 was the planned official start up date for the new Gatso cameras marked "G" above, but they started on June 11. See Ticketing Highlights, below. (12) On 10-23-17 the City provided monthly grand totals it created for the first three months of operation of the Gatso system, beginning on June 11, but no camera-by-camera breakout. The figures in red type are "raw" violations recorded by the cameras, the figures in black type are straight through citations issued and the figures in blue type are rolling right citations issued. "The number of citations will be increased [compared to the figures they sent the previous day, 10-23-17] because Gatso factors in transfers of liability and changes of address as a new citation. The numbers that I gave you in the prior emails [on 10-23-17] are the actual number of citations issued." (14) In Sep. 2018 and Oct.2018 we received two kinds of official reports. In the table above we have posted the figures from only the report entitled "Issued Citations by Approach." We have asked the City to tell us the significance of the reports entitled "Citations Resulted from Captured Violations by Approach" and "All Violation Events Detail." All reports are available at the link, above. (15) For more info about monthly revenue, see Set # 7, below. In a Mar. 15, 2017 article the Beverly Press reported that according to a City transportation engineering technician, "as of now, rolling right turns will not face penalties." However, in a May 8, 2017 article (archived copy) wehoville.com reported that the sheriff was proposing to enforce on right turns, and then the question was put on the agenda of the June 5 city council meeting. The council approved right turn enforcement by a vote of 4 - 1.
public safety concerns should not involve violations with vehicle speeds under 10 mph." The contract with Gatso was amended to allow the right turn enforcement. See Set # 6 below for copies of the amendments. If you receive a right turn ticket from West Hollywood and the photos don't show one of the situations underlined above, please contact me. During a visit to the courthouse, I talked to a lot of defendants and many of them showed me their tickets. The first thing I noticed was that you can't read the numbers on the tickets that WeHo mails to defendants. The very critical tenths digit is a smaller font size, so no one could tell for sure how late they were after the red, or how long the yellow was. The tenths digits were not legible on any ticket I saw - and we looked at them in good sunlight, with as many as two pairs of reading glasses at once! A sample ticket posted by the West Hollywood sheriff illustrates the illegibility. I attended the June 19, 2003 trial session for West Hollywood tickets, and purchased a copy of the official tape of that session ($10.00). The first part of the tape has now been transcribed, and is available here: WeHo Trial Transcript . It is a good way to find out how an actual trial goes. Vehicle Code Section 21455.5 requires that a city shall develop "uniform guidelines for screening and issuing violations." Here are WeHo's former "Business Rules for the Red Light Camera System," from 2005, which appears to that sort of document. Late Times and Speed, beginning in Oct. 2017, are linked in Set # 1, above. In the 2010 contract, the City agreed to pay WAY too much rent - approx. $2597 per camera per month. For example: In March 2014 the City of Elk Grove, California approved a new contract which specified the following schedule of rents for their five cameras. Under the 2010 - 2015 contract, WeHo paid 73% too much (compared to the Elk Grove price schedule, before any adjustment for economies of scale - the contract was for 18 cameras) over the five years of the extension, $1,184,616 extra. To cover that extra rent, WeHo needed to issue an extra 15,188 tickets (the City's fine revenue averaged $78 for each ticket it issued, in 2013). For more info about how much cities pay for their cameras, see FAQ # 17. The contract was to expire in June 2015, so at their Mar. 2, 2015 meeting the city council considered a staff recommendation to put the operation of the program out for bid. The Mar. 2 staff report promised an evaluation of the program, but only after the signing of the new contract. The council (with one member absent and one seat vacant) adopted the staff recommendation, 3 - 0, without any discussion other than Mayor D'Amico saying, "I would like to note my 'no' vote." SaferStreetsLA submitted a detailed report suggesting that the program be discontinued. The council voted 3 -2 (ayes: Duran, Horvath, Heilman) to accept the staff recommendation. The council was given no information about the bid by the incumbent vendor, Xerox/ACS - how much they bid, what equipment updates they may have offered. (In 2014 Beverly Hills chose them as their new vendor.) There was no bid from ATS, the largest camera company in the US. The City agreed to pay Gatso nearly twice as much rent, per camera, as it had been paying Xerox/ACS. That monthly rent will set a quota - to break even the city will need to issue more tickets per camera. During the five years the City will need to issue 25,000 tickets just to cover the rent owed Gatso, plus another 10,000 tickets to cover the cost of staff (equaling 583 tickets a month). Those tickets will bear $17.5 million in fines. Under the Gatso contract (signed copy, including brochure) the number of cameras dropped from 18 to eight. Initially, Gatso's cameras are to monitor the eight approaches marked "G" in Set # 1 above, but they may end up at other locations, including the former locations marked "X," because the new contract (paragraph D7 in Exh. A) allows the City to move each camera once, without charge, during the five-year term. The Sept. 21, 2015 staff report provided no detail about the most important part of a camera program: Is it saving lives? The six page staff report had just two generalized statements about safety. It said (on page two, middle), "The City has been successful in reducing accidents and violations throughout the 16 years of program operation." And, at the bottom of that same page it said, "Parameters studied included... 5-year accident history (both broadside and rear-end collisions), severity of injuries related to collisions, traffic volumes, and vehicle speeds." That's all the staff report said about safety. No camera-by-camera or year-by-year statistics from 16 years of operation during which the City issued 215,440 tickets bearing $100 million in fines. No breakdown of accidents by type (broadside, rear-end), severity, or whether they were actually caused by red light running - or something else. 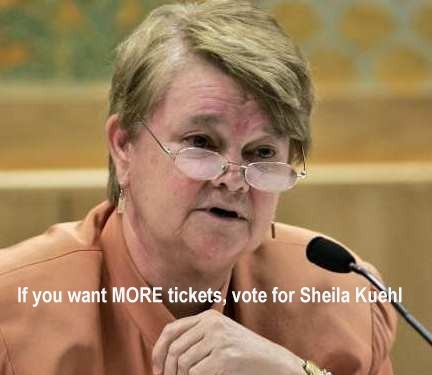 The new contract contains no provision for the issuance of Snitch Tickets, the investigatory "Courtesy Notice" forms recognized in SB 1303 of 2012. Absent access to the Snitch Ticket tool, the City will have just two poor choices when there's an obvious mismatch between the pictured driver and the registered owner. 1. File charges against the registered owner, without Probable Cause. 2. Reject the violation. cameras on La Cienega Blvd. at Melrose Avenue." The five-year contract term began when the cameras began operation. A staff email said the cameras began operation in March 2017 and that the contract will expire on Feb. 28, 2022. Section 6.1 of the contract allows the City to end the program at any time, on short notice, although for a cancellation prior to March 2020 the City would have to pay a prorated penalty to Gatso. The City's monthly ticket revenue from the court is available in the Revenue Spreadsheet on the LA County Docs page and is also noted in a column in the Set # 1 table, above. 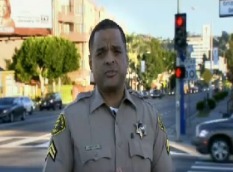 In 2012 the West Hollywood Sheriff posted some informational videos, on his website. Those videos became partly out-of-date in 2016 when the City switched over to a new camera provider and also began citing for right turns, so the Sheriff removed them from their website. As of Jan. 2019 the red light camera section of the Sheriff's website says only, "More information coming soon," so highwayrobbery.net has provided links to the YouTube copies of the old videos. There may be some more West Hollywood information posted in the next few weeks. Mark your calendar to remind you to come back here and look!